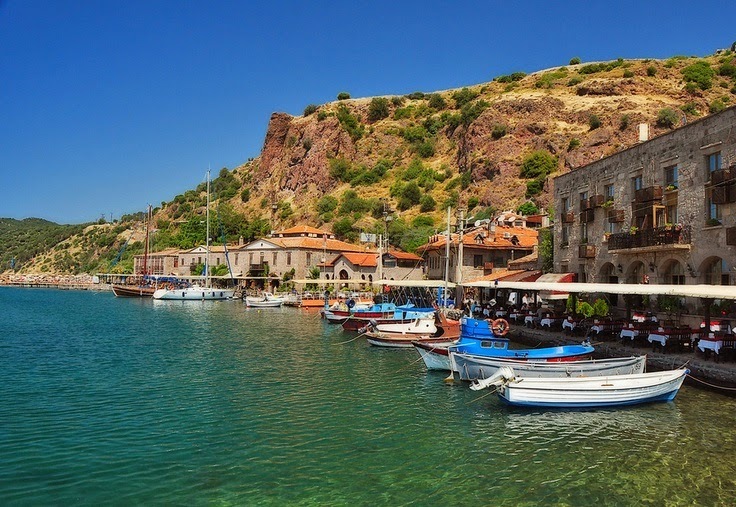 Assos is one of the few ancient sites with people still living and working in it. Aristotle, Plato’s most famous student and tutor of Alexander the Great, lived and taught here for three years. Outside the north gate of Assos you can find burial sites with many Sarcophagi and terracotta tombs. From the entrance to the city, you will see twenty meters high walls leading into the Gymnasium, Agora and finally the Theatre. There are also buildings and churches from the dark ages. Some guests rise early to climb to the Temple of Athena to enjoy the dawn to the sound of goats’ bells. The fishing harbour which used to be a port for acorn shipment, has a cluster of restaurants and a small beach. Handicrafts, jewellery, carpets and antiques can be bought in the market square. Nearby, Kadırga has very clean and beautiful beach. Nature walks to pick herbs and mushrooms are popular, too. Other places of interest include: the ancient city of Troy, Apollo Smintheion, ancient city of Bergama, Zeus Altar, Cleopatra’s Bath, many waterfalls and gorges on Mount Ida. Visit the assos.org website for more information.